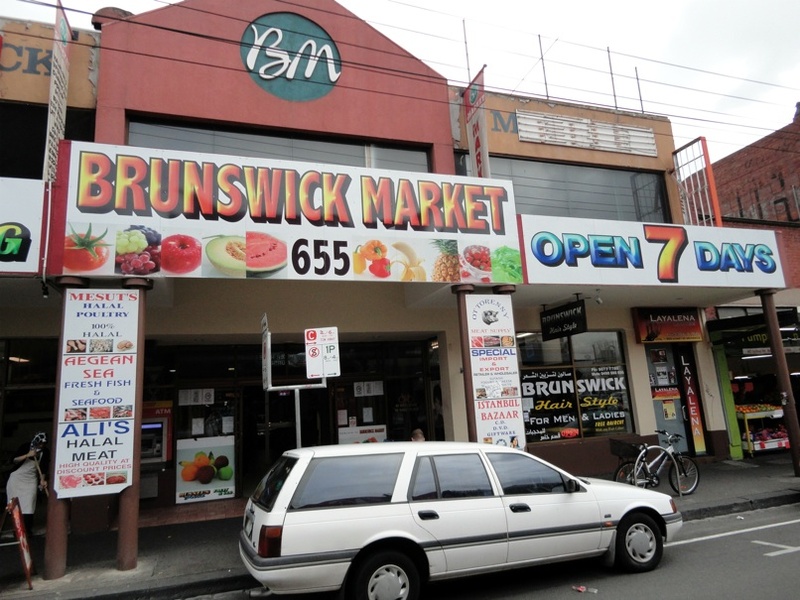 Many, many years ago – about 25, I think – yours truly aboded near the juncture of Albion and upper Lygon streets in Brunswick for a couple of years, so was then quite familiar with the stretch of Sydney Rd inhabited by Brunswick Market. 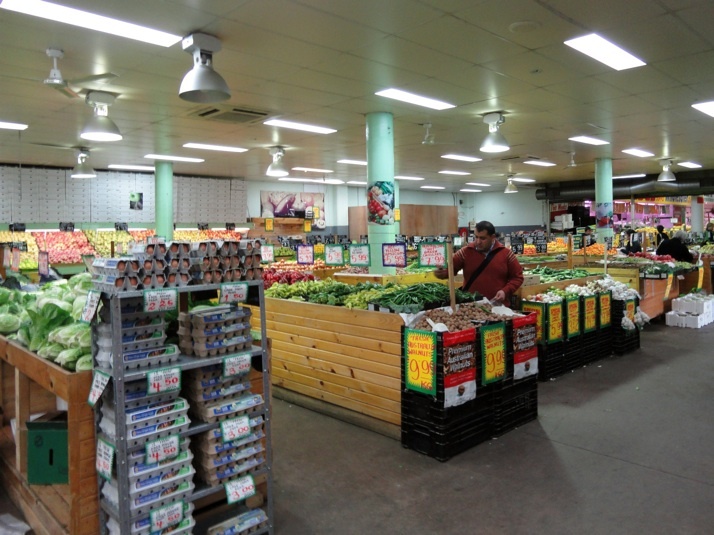 In those days, it was a lively place that could hold its own with Melbourne’s many other revered markets. It’s a bit of a faded beauty these days. It never gets spoken of in the same breath as the very famous A1 Bakery just a few doors down. 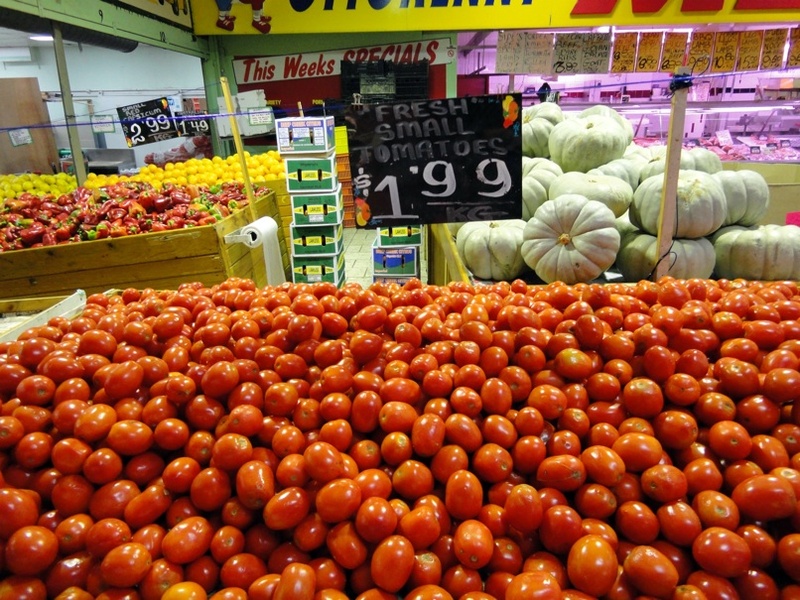 Nor will you hear it mentioned along with markets Footscray, Vic, Saigon, South Melbourne or Prahran. 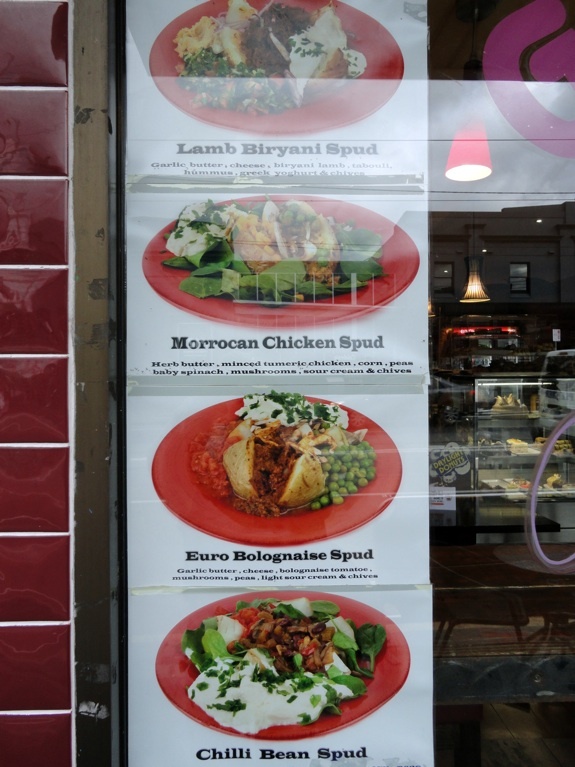 But in recent years we have been returning to take in not just the market but also a few pizzas at Tabet’s and the general lively ambience of Sydney Rd, so different from our regular westie haunts yet also so familiar. 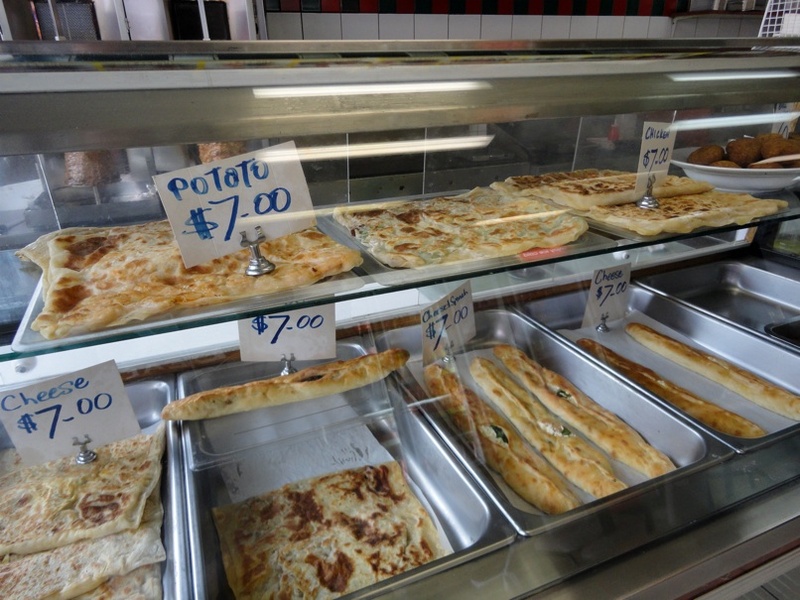 I start my Friday adventure at Central Kebab House, right at the entrance to the market. 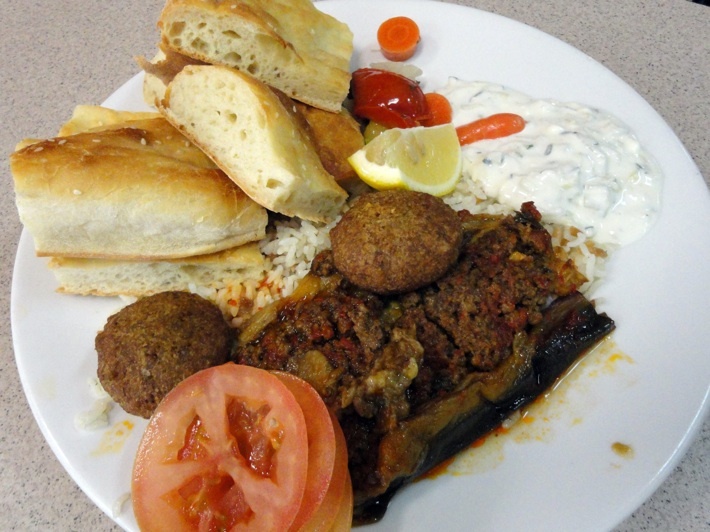 I opt for the eggplant plate ($7.50), as the halved eggplants topped with lamb mince have caught my eye. 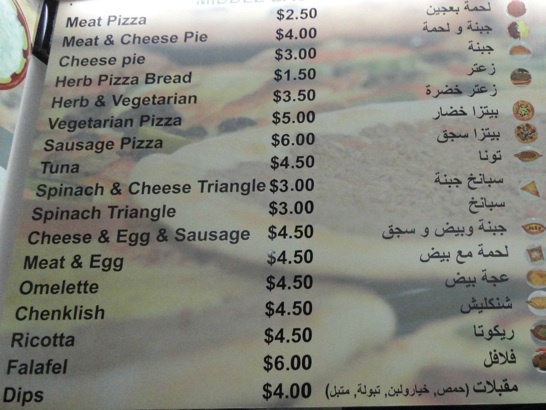 I ask for a couple falafels and some pickled veggies to be added, for which I am not charged. Bennie I have had some swell feeds here before, but this is a bit lacklustre. The cucumber/yogurt dip has no zing, the felafels are a bit rubbery and the eggplant/mince combo, too, is just OK.
From there I venture into the market proper. 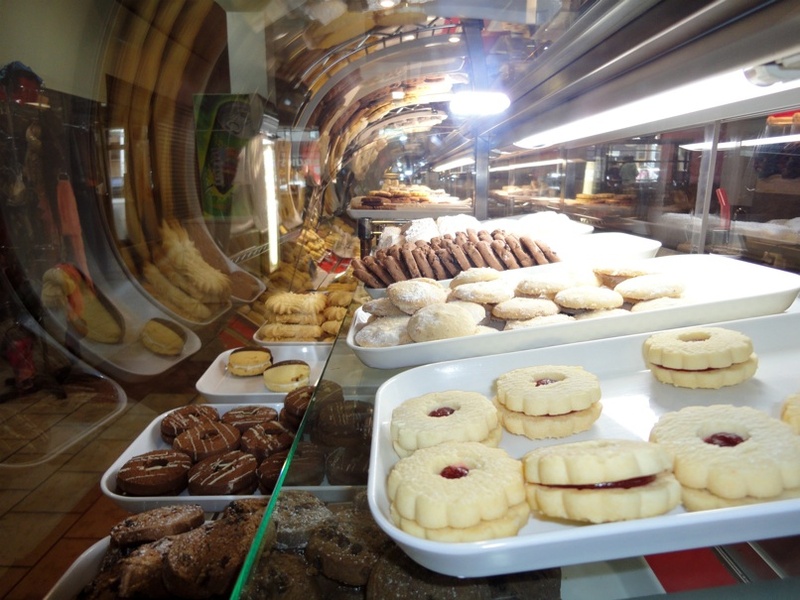 What was once, a few years back, a low-key outdoor/indoor eatery that served up darn good dips ‘n’ bread ‘n’ salads has become a sweetie place that dispenses cake/biscuits of both continental and Middle Eastern genres. 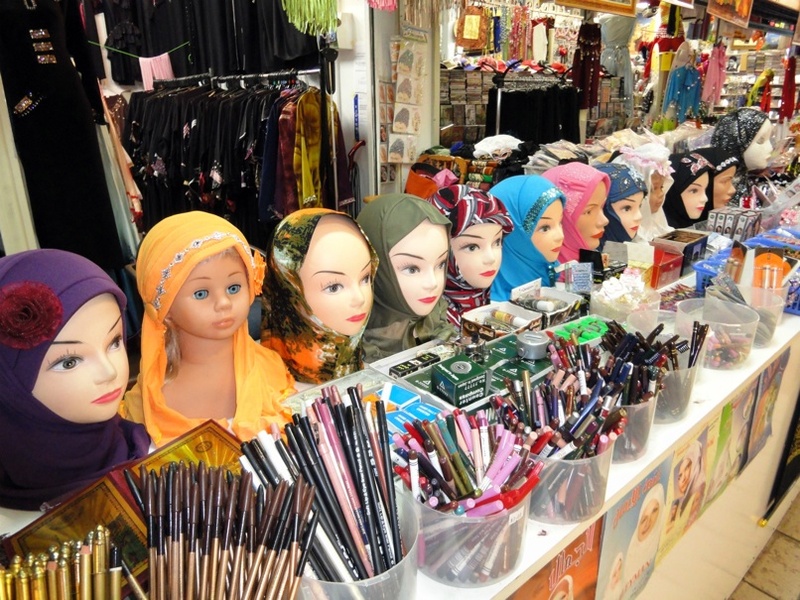 Around it are arrayed a deli and clothing/trinket outlets of mostly Turkish flavour. 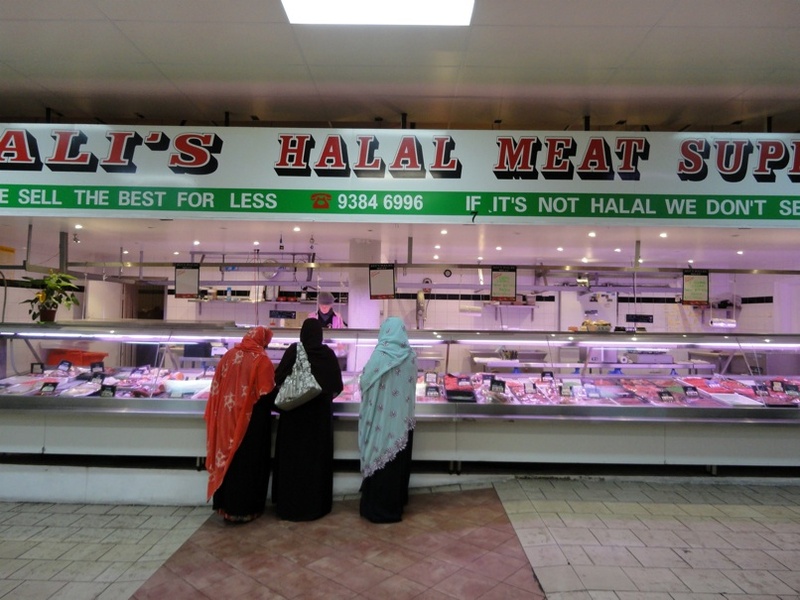 The market has three butchers – a regular continental style, and one each of the halal variety for poultry and red meat. At the continental joint, Ottorenny, I become very interested in some good-looking sausages. I suspect some of them at least are Maltese or something equally exotic. But I’m told that, no, they’re all of Italian heritage. The darkest of the lot are pork and pork liver. I’ve yet to be tempted by the pork liver dishes I’ve come across in my mostly unhappy experiences with Filipino food, but I figure that as part of a highly seasoned and prepared sausage with regular pork meat, it may make for a winner. So I buy four of them, just to see. I’ll be telling Bennie of the nature of ingredients after we’ve eaten them. 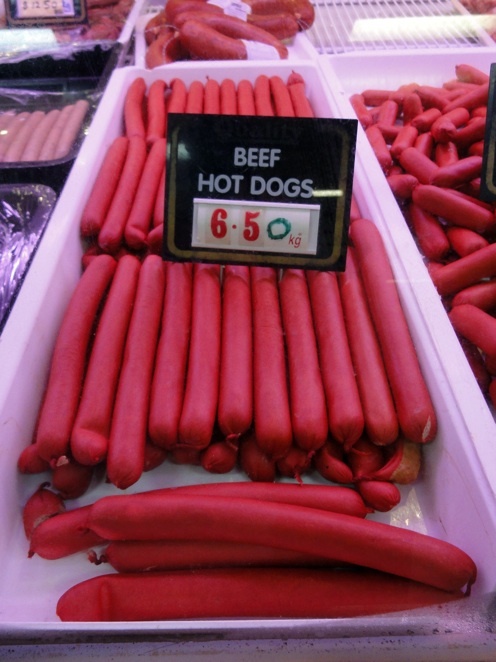 At Ali’s Halal Meat Supply, I likewise buy a sample deal of four hot dogs – if they taste good, we’re on to a winner, as they’re an incredible $6.50 a kilo. My four cost 50 cents each. 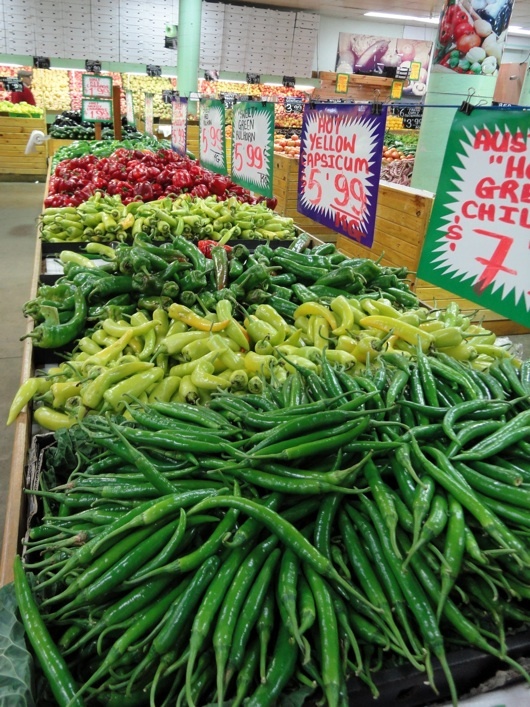 Right at the end of the market is a large fruit and vegetable outlet. I have no pressing need to stock up on such items, but note that the range and prices are impressive. 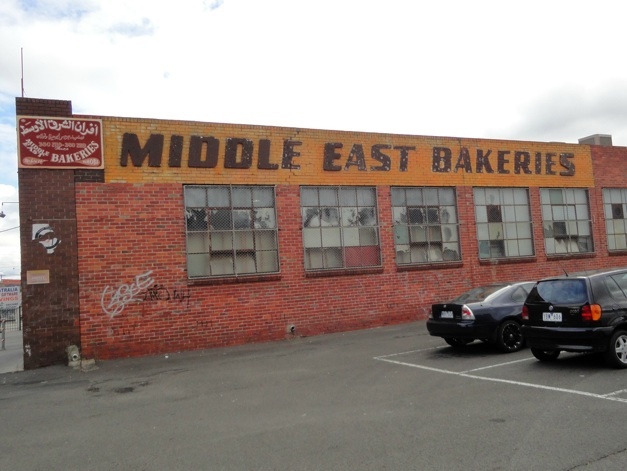 Part of the fun of visiting this part of Melbourne is the maze of back streets between Sydney Rd and the railway line – a jumble of gloriously ungentrified light industry, oddball food service outlets, funky housing and much kool stuff. It is via these back streets that I am headed for the Book Grocer – love the name! – at 453 Sydney Rd. 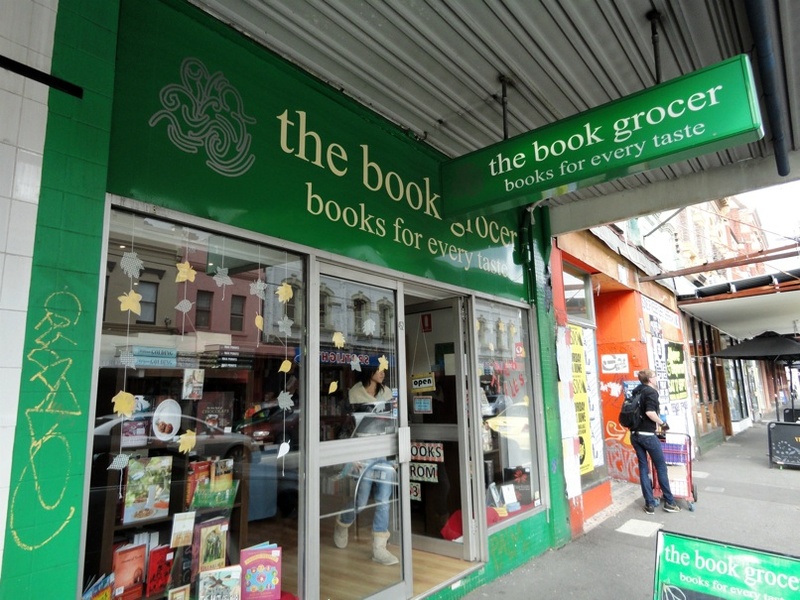 Using, I am told, some of the same suppliers as Dirt Cheap Books, the Book Grocer is a very different enterprise indeed. The range here is much more high-toned, with a wide range of stock that seems particularly strong on history, biographies and other non-fiction goodies. 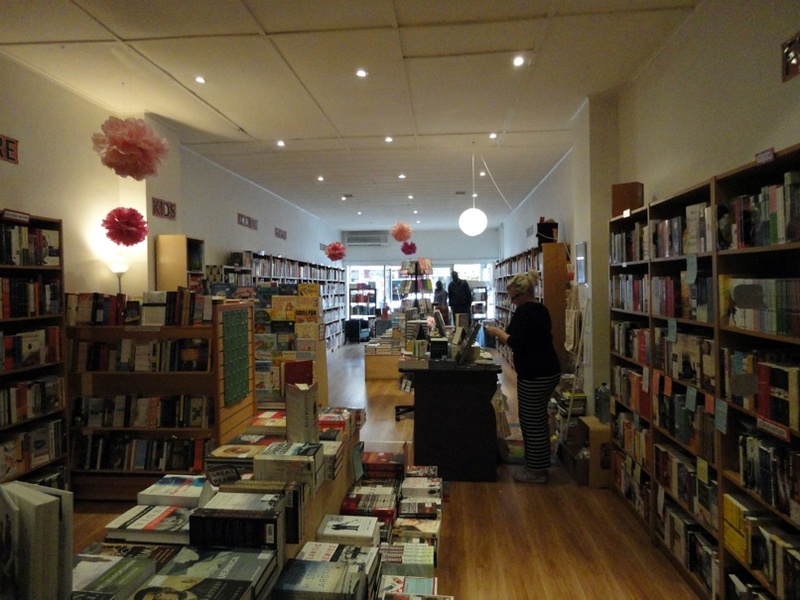 Almost seems like a regular high-quality bookshop! 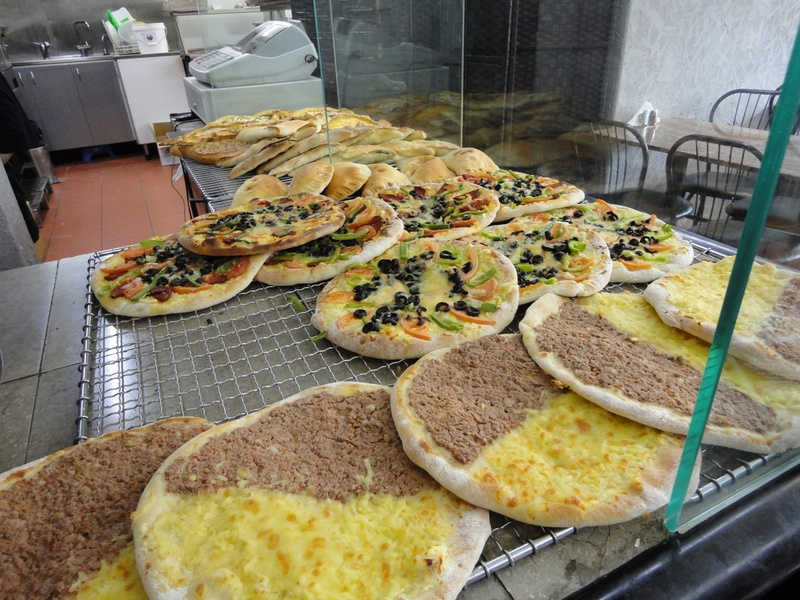 Further up Sydney Rd, I stop to gander at the yummy pies and pizzas at Al-Waha Bakery, at 819 Sydney Rd. We’re currently well-provisioned with such as these in the freezer at home, so I make do with a single ricotta and spinach pie just for assessment’s sake. 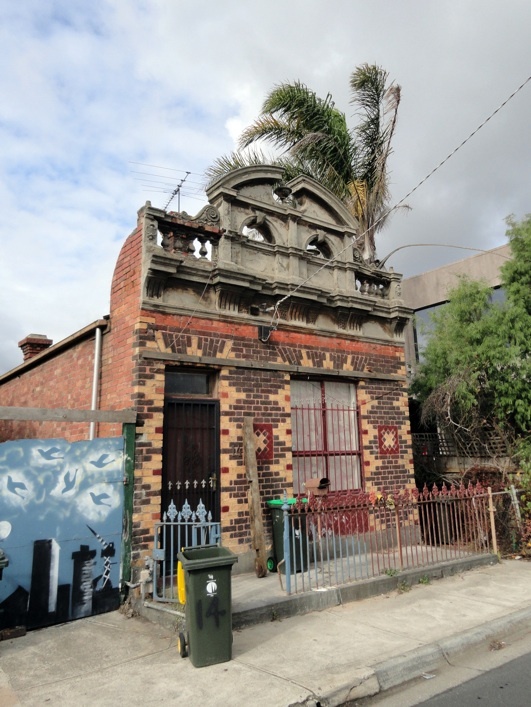 The busy and bustling stretch of Sydney Rd leading up to Bell St and Pentridge Prison surprises me – I must have been hereabouts many times before, but I have no recollection of it whatsoever. 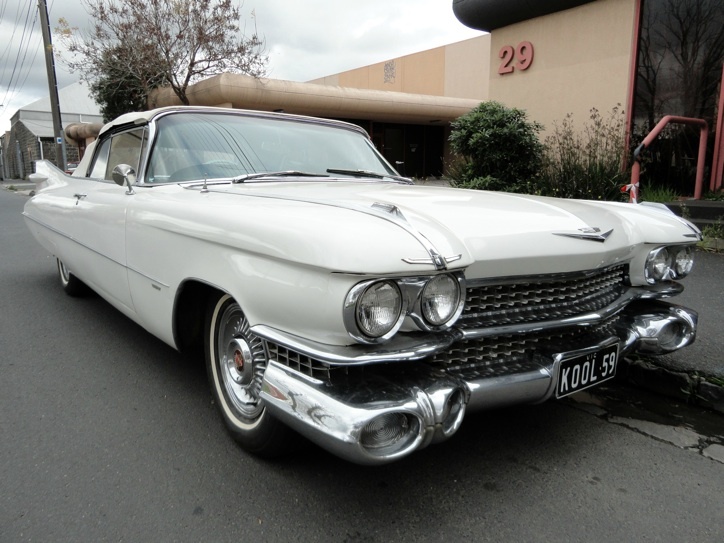 There’s pokie little arcades, a zillion kebab and cake shops, Oriental massage places. Wandering up one side of the road and down the other, my sense of dislocation and newness is such that it feels like when I arrived from (mostly whitebread) New Zealand so many years ago and inner-city Australia seemed so intoxicatingly exotic. I even find, looking out over a packed parking lot, an intensely interesting place with a super-long menu of dumplings and noodles that is sure to be the subject of a future adventure. How were the Filipino sausages? 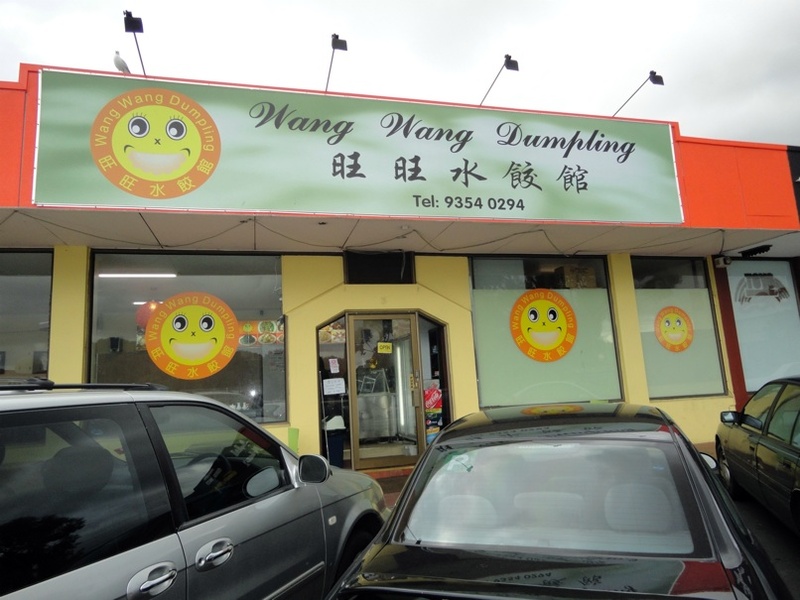 You mention not-so-great experiences with Filipino restaurants – what are the Filipino takeaway places at Footscray market like, any idea? Hi James. 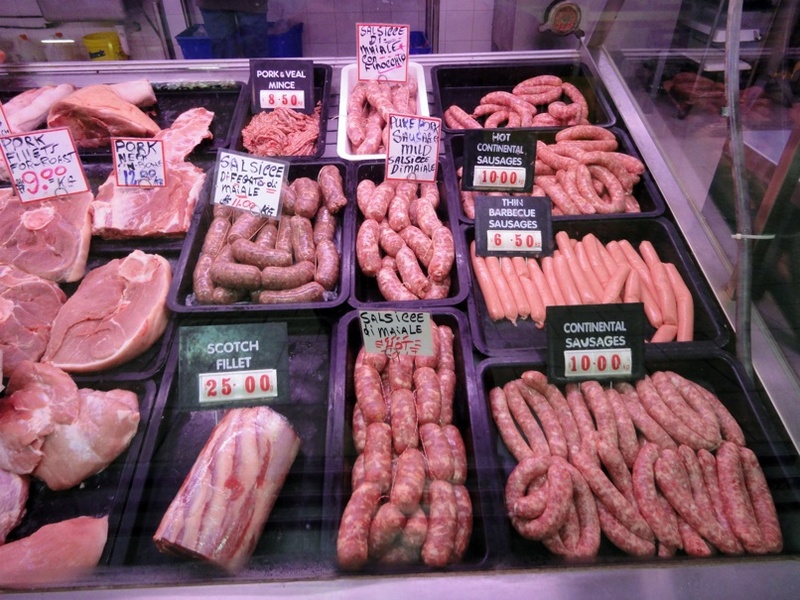 The sausages are Italian – but they do have pork liver in them, like several Filipino dishes. We’ve yet to eat them. I’m hoping to get my act in order and start posting post-scripts on goodies we’ve bought and had at home later. I look at the market stalls you speak of every time I’m there, but all looks too heavy for me. I think I’m done with Filipino food for a while. Maybe until the next fiesta!